Is the blockchain as revolutionary as agriculture? Fingers crossed, but Day 1 of U.S.-South Korea military exercises passed uneventfully. “With easing tensions in North Korea, prices for cryptocurrencies have settled back down,” says our crypto maven Louis Basenese. No doubt. “A spike in international tensions always sends investors looking for nontraditional investment options,” Lou explains. “They’re essentially security blankets during a time of increased uncertainty. “Traditionally, gold has been the nontraditional asset of choice. But not this time around! Gold prices barely budged. On the rare occasions this year that the stock market has experienced a one-day shock, gold ticked up. “But bitcoin rose radically higher,” says one of Lou’s top analysts, Jonathan Rodriguez. Aug. 17 (last Thursday): The S&P takes a 2% spill and gold rises 0.7%. But bitcoin outperforms gold tenfold, jumping 7%. Or looked at another way, it’s one more catalyst for the dramatic price moves that carefully selected cryptocurrencies make — far greater than the moves in bitcoin. “Crypto-quakes,” is what Lou calls them. And he’s anticipating three of them, very soon, that could mint a new class of crypto millionaires. Click here and let Lou show you how you could be one of them. Now to the markets, where it’s a risk-on day. At last check the Dow has tacked on 132 points to reach 21,835. That means it’s still 165 points shy of the 22,000 mark that’s proven awfully stubborn this month. Treasuries are selling off, the 10-year yield now 2.2%. Ditto for gold, the bid down to $1,285 and another run at $1,300 aborted. Back to those U.S.-South Korea military drills for a moment: “Fasten your seat belt,” warns Jim Rickards. As noted above, Aug. 10 was one of the four worst days for the stock market this year. Only this time Jim expects a twist: “Kim may surprise the world with a submarine-launched missile. That’s a big deal because submarines can evade anti-missile defenses such as the U.S. THAAD system deployed in South Korea. “Submarines can also get close to U.S. shores, which reduces the warning time for an attack. It also reduces the needed missile range so that Kim can kill Americans with smaller and easier-to-produce missiles. Jim believes the situation is as serious as any in the last 70 years, based on a government document that recently came into his possession — and driving one small group of stocks much higher. “A world with an unlimited supply of transplant tissue is on its way,” says Ray Blanco with his take on the recent news that science has taken a huge step closer toward transplanting pig organs in humans. The breakthrough that made headlines a few days ago is based on something we mentioned awhile back called CRISPR — a gene editing mechanism discovered in bacteria in 2012. “Researchers have edited one gene sequence responsible for a retrovirus and raised pigs without them,” Ray explains. “One day, they might be able to edit all genes responsible for tissue rejection. 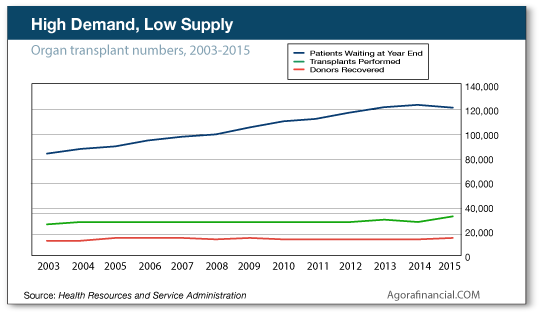 “This advance of gene-editing technology isn’t going away, and enormously profitable new therapies will emerge from current research.” Ray already has readers of Technology Profits Confidential in one gene-editing name… and he has his eye out for more. 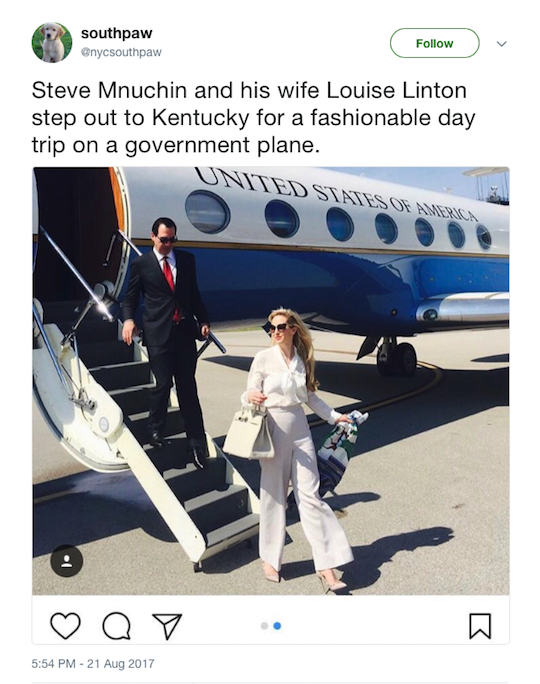 And now we present our candidate for the “Whiskey Tango Foxtrot” financial moment of 2017 — Treasury Secretary Steve Mnuchin’s visit yesterday to Fort Knox, Kentucky. So why is he the first Treasury secretary to pay a visit in over 60 years? What’s the occasion? Why now? Silence. The post didn’t exactly “break the internet,” to use a well-worn phrase… but it did make a small dent. “Glad we could pay for your little getaway,” said one commenter. The Washington Post tells us Treasury secretaries typically fly commercial within the United States. But the Treasury Department says Linton’s travel costs were covered by the couple, not the government. The 5: New paradigms are different. They break historical molds. John McAfee, who we mentioned here last week, likens the advent of the blockchain to the advent of agriculture: “Prior to this adoption, the great thinkers within society struggled with how to determine when to break camp and move to more fruitful lands, how to limit the size of a village so that sheer numbers did not quickly deplete the available food in a new area and how to design lodging so that could be quickly dismantled for a sudden move. P.S. Did you play it? Readers of Rickards’ Intelligence Triggers had a chance to collect 43% gains yesterday on Amazon put options. Not bad for 28 days. Amazon’s lousy earnings numbers are largely responsible for the winning trade. And we’re still waiting for the Trump Justice Department to launch an antitrust investigation into Amazon — which will serve up yet another trade opportunity in the near future. If you want to be on board, here’s where to go.